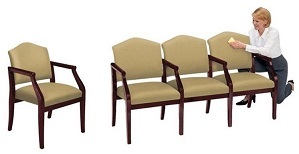 Your waiting room is the first image of your office that customers or patients see when they come into your office. You can make a good first impression on them by providing an inviting space for them to wait in. Your waiting room should be comfortable, pleasing to the eye, and uncluttered. 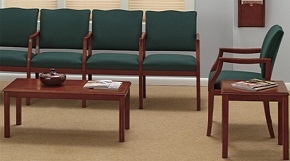 Comfortable, yet durable seating and tables are the first requirement to a client-friendly waiting room. At Office-Chairs-Discount.com we offer sofas, club chairs, love seats, armchairs and occasional tables that are all commercial grade. Many of our products are made by the industry's finest craftsmen and shipped directly from High Point, North Carolina, the furniture capital of the world. From traditional to a more contemporary style, when choosing sofas, loveseats & club chairs we offer many styles and fabrics to choose from to make your office reflect the success you know your business deserves. Another way to add charm to your waiting room is to place plants, magazines, and artwork around the room. If your waiting room is in a medical facility, be careful not to overdo the anatomy charts. Instead, choose art that reflects the design of the room as well as your own personal taste. Views of the outdoors, popular prints by famous artists, or scenic photographs are a few ideas that could help to ease and comfort your patients. Keep magazines and other literature up to date and be sure to carry titles that interest the full range of visitors. If you wish to educate them about your business or industry, you can add some pamphlets or other educational materials to the mix. Also, let Office-Chairs-Discount.com be the one and only place you shop for high-quality, durable yet fashionable office furniture. Contact us now to place your order today.